For Surviving Nuclear Fallout, Blast and Radiation Threats with FREE nuclear fallout shelter plans, books & ready made nuclear fallout shelter sources! We've been promoting Nuclear Civil Defense Training of the public for well over a decade! CLICK TO ORDER KI & RAD DETECTION HERE! Who Needs a Nuclear Shelter Strategy? What are the Nuclear Blast and Thermal Pulse Effects? What are the Nuclear Radiation and Fallout Effects? What's the Difference Between Alpha, Beta and Gamma Radiation? What's the Difference Between Roentgen, Rad and Rem Radiation Measurements? Do I Need A Radiation Detector? What Areas are Likely Targets? What's Required for Nuclear Sheltering? What Plans or Ready-Made Shelters are Available? NEW RADSticker™ $5 Peel & Stick Radiation Dosimeter! NukAlert™ 24/7 Key-Chain Radiation Detector & Alarm! Civil Defense Radiation Detection Survey Meters, Geiger Counters & Dosimeters FAQ! See the Only County In U.S. that's re-established their Civil Defense Fallout Shelters! This is PART 2 Part 1 is HERE! Q: What are the Nuclear Radiation and Fallout Effects? A: All nuclear explosions release radiation, both initial radiation and residual or nuclear fallout radiation. The initial radiation makes up about 5% of the total energy released by a nuclear explosion and is released well within the first minute following the detonation. 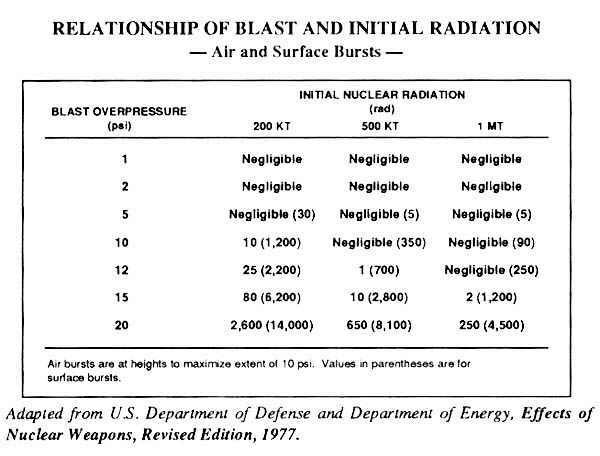 The threat of exposure to injurious levels of this initial radiation are confined typically to within a radius of about 1.50 miles from the nuclear detonation of anything less than a 1 MT bomb. Within this range, and out in the open and exposed without blast and thermal pulse protection, you most likely would also suffer lethal injuries from the blast impact and burns. One other effect of the initial radiation that is of concern only from very high altitude nuclear explosions is called the Electromagnetic Pulse or EMP. This very brief, but powerful electrical field is expected to disable electric power and communications on the ground as well as satellites. While it causes no direct harm to people when detonated at its high altitude optimum heights, it is expected by the DoD to be the first shot fired to effectively knock out the electrical grid and communications below it. Even one large correctly placed nuclear explosion over the center of the U.S. could severely disable most all the electrical power and communications from coast-to-coast. More information on EMP effects can be found in the Nuclear War Survival Skills book. What will be of concern to the greatest number of people, though, is the remaining 10% of the energy unleashed by a nuclear explosion, the residual or nuclear fallout radiation. 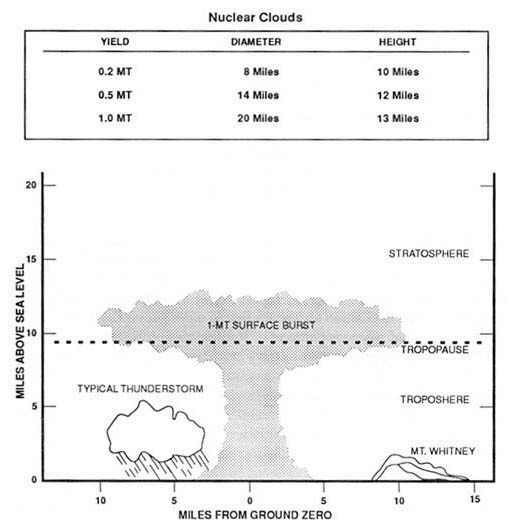 Any nuclear detonation on the ground, or where an airburst was low enough that the fireball touched the ground, will create tons of radioactive materials that will be sucked up into the classical mushroom shaped cloud to then be spread far downwind. These radioactive particles carried by the wind then later fall out both near and many miles away from ground zero and are the source of what we know as radioactive nuclear fallout. Each of these trillions of contaminated particles gives off invisible radiation while in the mushroom cloud, while descending, and after having fallen to earth. If you remember the dust and ash that had covered many parts of the U.S. hundreds of miles away from the eruption of Mount St. Helens, then you have an idea of how far and wide tons of radioactive nuclear fallout sucked miles high into the atmosphere can then later be deposited well away from its initial ground zero source. (However, we would not see it ankle deep like some did downwind of Mount St. Helens.) This radioactive nuclear fallout, spread by the winds and eventually covering hundreds of square miles, has the potential to kill many more people downwind than those unfortunate enough to have been at or too close to ground zero. There's some 'good news', too, regarding how quickly it loses it's intensity that will be covered in the next, and last, Part 3 section. Few realize, too, that surface nuclear tests conducted in the Soviet Union and China have covered much of the U.S. with low levels of radioactive nuclear fallout in the past. Many are concerned that a serious nuclear exchange in the Mid-East, Iran, Korea, between India and Pakistan, or elsewhere, could, at the minimum, result in serious contamination of milk and other foodstuffs here in the U.S., too. See/Read Trans-Pacific Fallout for more details. The heaviest particles normally fall closest to ground zero and at the other extreme the smallest of the particles, invisible to the naked eye, can travel thousands of miles on the winds and some of it will stay suspended for decades. The larger the bomb, the more nuclear fallout and higher the mushroom cloud and the likelihood of the nuclear fallout being dispersed further and suspended longer in the upper atmosphere. But, with rain showers, all sized radioactive nuclear fallout particles can be brought down much sooner and can create localized 'hot spots'. However, at any one place where the nuclear fallout from a single explosion is being deposited on the ground in concentrations strong enough to require the use of protective shelters, this deposition will usually be completed within a few hours, once it begins. 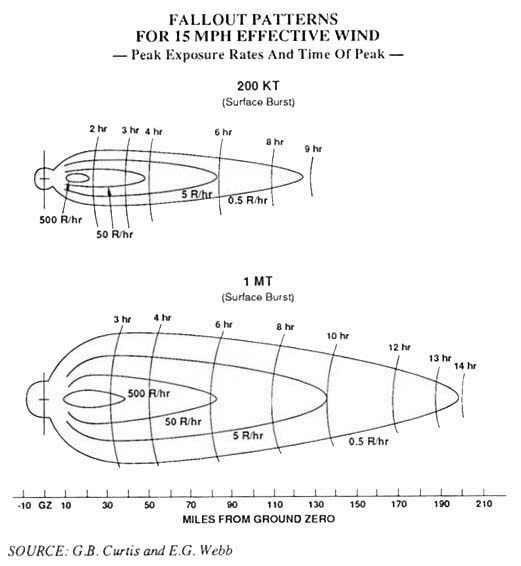 The above 15 mph nuclear fallout pattern examples do not reflect that the winds are often moving in different directions and at different speeds at different altitudes. Only generalizations should be inferred from them. The maps do show that the highest levels of radioactive nuclear fallout can be expected closest to ground zero and then trail off with distance. One exception, though, would be from rain showers creating hotspots downwind. Read Trans-Pacific Fallout for an example of that happening in 1953 in Troy, NY from a nuke test in Nevada a few days earlier. Bottom Line: While the blast, shock wave and thermal effects are nearest ground zero, the residual radiation effects via nuclear fallout can endanger thousands more and for 100's of miles downwind. It is this radiation hazard carried on the winds that holds the potential to sicken and kill the greatest number of people. As seen above, the nuclear fallout radiation, measured in R/hr, is highest nearest to ground zero. But, as Chernobyl proved with documented cases of radioactive iodine, causing thyroid cancer 500 km (310 miles) downwind, the danger zone truly is extensive. (While not high enough to be harmful, radioactive iodine was even measured in dairy milk from cows grazing Chernobyl nuclear fallout contaminated pasture fields in the State of Washington.) Radioactive Iodine is a special case, expected to be responsible for the majority of health issues the farthest downwind and affecting the greatest number of people then. Fortunately, there is an easy and cheap prophylactic OTC drug in Potassium Iodide that can give nearly 100% protection. There is too much to be said about radioactive iodine and potassium iodide to do so here. See the Trans-Pacific Fallout for more details on thyroid cancer creating radioactive iodine from afar, and for when it's up much closer, too. Next, we'll explore the different kinds of radiation, their measurement units and, finally, how much is too much. Q: What's the Difference Between Alpha, Beta and Gamma Radiation? A: Everything in nature would prefer to be in a relaxed, or stable state. Unstable atoms undergo nuclear processes that cause them to become more stable. One such process involves emitting excess energy from the nucleus. This process is called radioactivity or radioactive decay. "Radiation" and "radioactivity" are often confused, the proper relationship is that "radioactive atoms emit radiation." Alpha: These are actual particles that are electrically charged and are commonly referred to as alpha particles. Alpha particles are the least penetrating of the three primary forms of radiation, as they cannot travel more than four to seven inches in air and a single sheet of paper or the outermost layer of dead skin that covers the body will stop them. However, if alpha particle emitting radioactive material is inhaled or ingested, they can be a very damaging source of radiation with their short range being concentrated internally in a very localized area. Beta: These are also actual particles that are electrically charged and are commonly referred to as beta particles. Beta particles travel faster and penetrate further than alpha particles. They can travel from a few millimeters up to about ten yards in open air depending on the particular isotope and they can penetrate several millimeters through tissue. Beta particle radiation is generally a slight external exposure hazard, although prolonged exposure to large amounts can cause skin burns and it is also a major hazard when interacting with the lens of the eye. However, like alpha particles, the greatest threat is if beta particle emitting radioactive material is inhaled or ingested as it can also do grave internal damage. Gamma: Gamma rays are similar to x-rays, they are a form of electromagnetic radiation. Gamma rays are the most hazardous type of external radiation as they can travel up to a mile in open air and penetrate all types of materials. Since gamma rays penetrate more deeply through the body than alpha or beta particles, all tissues and organs can be damaged by sources from outside of the body. Only sufficiently dense shielding and/or distance from gamma ray emitting radioactive material can provide protection. Bottom Line: All three of the primary types of radiation above can be a hazard if emitted from radioactive nuclear fallout that was inhaled or ingested. Protected food and water and even a simple inexpensive dust protector face mask can go a long ways to denying this route of entry. However, for the penetrating gamma rays, it is essential to be able to identify the best protected shielding and distance options available, covered in the next, and last, Part 3 section. More information on the specific physical damage caused by gamma radiation is below in the section entitled: How Much Radiation Is Too Much? Q: What's the Difference Between Roentgen, Rad and Rem Radiation Measurements? A: Since nuclear radiation affects people, we must be able to measure its presence. We also need to relate the amount of radiation received by the body to its physiological effects. Two terms used to relate the amount of radiation received by the body are exposure and dose. When you are exposed to radiation, your body absorbs a dose of radiation. Roentgen: The roentgen measures the energy produced by gamma radiation in a cubic centimeter of air. It is usually abbreviated with the capital letter "R". A milliroentgen, or "mR", is equal to one one-thousandth of a roentgen. An exposure of 50 roentgens would be written "50 R". Rad: Or, Radiation Absorbed Dose recognizes that different materials that receive the same exposure may not absorb the same amount of energy. A rad measures the amount of radiation energy transferred to some mass of material, typically humans. One roentgen of gamma radiation exposure results in about one rad of absorbed dose. Rem: Or, Roentgen Equivalent Man is a unit that relates the dose of any radiation to the biological effect of that dose. To relate the absorbed dose of specific types of radiation to their biological effect, a "quality factor" must be multiplied by the dose in rad, which then shows the dose in rems. For gamma rays and beta particles, 1 rad of exposure results in 1 rem of dose. Other measurement terms: Standard International (SI) units which may be used in place of the rem and the rad are the sievert (Sv) and the gray (Gy). These units are related as follows: 1Sv = 100 rem, 1Gy = 100 rad. Two other terms which refer to the rate of radioactive decay of a radioactive material are curie (Ci) and becquerel (Bq). Bottom Line: Fortunately, cutting through the above confusion, for purposes of practical radiation protection in humans, most experts agree (including FEMA Emergency Management Institute) that Roentgen, Rad and Rem can all be considered equivalent. The exposure rates and doses you'll usually see will be expressed simply in terms of roentgen (R) or milliroentgen (mR). Remember, too, a milliroentgen, or "mR", is equal to one one-thousandth of a roentgen "R". For details on how much is too much "R", see the next Q&A section below entitled: How Much Radiation Is Too Much? Q: How Much Radiation Is Too Much? A: Before you can begin formulating a radiation protection shelter strategy (that will be covered in the next, and last, Part 3 section) you need to first understand and then determine the levels of radiation exposure one should be most concerned about in a nuclear emergency. Then the correct strategy best suited for the job will begin to reveal itself. The following is compiled from FM 3-7. NBC Field Handbook, 1994. FM 8-9. NATO Handbook on the Medical Aspects of NBC Defensive Operations, 1996. FM 8-10-7. Health Services Support in a Nuclear, Biological, and Chemical Environment, 1996. It is instructive in outlining the levels of radiation and their adverse health effects. Expected health effects for an adult assuming the cumulative total radiation exposure was all received within a weeks time. For children, the effects can be expected at half these dose levels. granulocyte counts. Increased susceptibility to opportunistic pathogens. percent of personnel. At 3 to 5 weeks: medical care required for 10 to 50%. geometrically increase morbidity and mortality. to 90 percent; mild to moderate fatigability in 50 to 90 percent of personnel. less than 10% deaths; at high end, death may occur for more than 50%. immunocompromised time-frame. Moderate to severe loss of lymphocytes. Hair loss after 14 days. dizziness, and disorientation; moderate to severe fluid imbalance and headache. The effects from the above radiation dose levels assume that the total dose was received over a short period of time of a week or less. You always want to try to minimize any radiation exposure to ALARA or As Low As Reasonably Achievable, ideally <100 rads, as that's still 100% survivable for healthy adults, if not exceeded. "Very few of those receiving acute doses (received within 24 hours) of less than 100 R would become sick, even briefly."NWSS. The response to radiation varies widely amongst people and the longer the time frame over which a specific dose is accumulated the better your body can respond to, and recover from, that radiation damage. In other words, a normally fatal (to 50% of a group exposed to it) cumulative dose of 530 R, if received all within a week or less, would create few noticeable ill health effects if it was received, but spread out over a years time at the rate of about 10 R per week. That would be less than 1.5 R per day. To illustrate further, consider the difference in acquiring a suntan gradually over a years time, at a rate of about an half hour per day. Compare that to packing that years worth of sun exposure (182 hours) all into one solid non-stop week, night and day, 24/7. The body would not be able keep up with repairing that damage and the detrimental health effect would be very dramatic, possibly fatal. Same principle here, regarding total cumulated radiation dose health effect, it depends upon the time frame it was received in. Remember, too, promptly removing yourself from the radiation source would have you no longer absorbing and adding to that cumulative dose. And, that can make all the difference between absorbing a dangerous radiation dose or getting only a tiny fraction you might not even be able to later notice. Q: Do I need a radiation detector? A: It should be readily apparent now that an essential tool to knowing and thus minimizing your family exposure to radioactive nuclear fallout is both acquiring and learning the proper operation of a radiation meter. "A survivor in a shelter that does not have a dependable meter to measure fallout radiation or that has one but lacks someone who knows how to use it will face a prolonged nightmare of uncertainties. Human beings cannot feel, smell, taste, hear, or see fallout radiation. Which parts of the shelter give the best protection? How large is the radiation dose being received by each person? When is it safe to leave the shelter for a few minutes? When can one leave for an hour's walk to get desperately needed water? As the fallout continues to decay, how long can one safely work each day outside the shelter? When can the shelter be left for good? Only an accurate, dependable fallout meter will enable survivors to answer these life-or-death questions. With a reliable dose rate meter you can quite quickly determine how great the radiation dangers are in different places, and then promptly act to reduce your exposure to these unseen, unfelt dangers. For example, if you go outside an excellent fallout shelter and learn by reading your dose rate meter that you are being exposed to 30 R/hr, you know that if you stay there for one hour you will receive a dose of 30 R. But if you go back inside your excellent shelter after 2 minutes, then while outside you will have received a dose of only 1 R."
In any future nuclear emergency, there will be many more people, both near and far, that are not in harms way, but won't know it without any radiation detection instruments. They will worry needlessly or, possibly, even panic. Others, who should promptly get to a safer area, won't know to do so either, or if they do go someplace else, won't be able to confirm that it is indeed safer, without such specialized devices. The key to assuring your family is safe, or have gotten safer, or even if any should later seek medical attention, or not, is only possible if you have your own radiation detection instruments, with you, right then. With them in-hand, in a for-real future nuclear emergency, it's like being the only one then with a flashlight in a blackout to promptly, and confidently, lead the safest way out! Get them wherever you can, especially if a crisis is already upon us as you are reading this, but be sure they are recently certified calibrated, especially if surplus FEMA Civil Defense meters or dosimeters. They are truly excellent instruments for radiation emergencies, when they are, and have been field-proven for decades, and are in current use by thousands of First-Responders nationwide. More info about them at our comprehensive Civil Defense Radiation Detection Survey Meters, Geiger Counters & Dosimeters FAQ! "Instruments that measure only milliroentgen-range dose rates are sold for war use by some companies. Since most Americans have no idea what size of radiation doses would incapacitate or kill them, and do not even know that a milliroentgen is 1/1000 of a roentgen, some people buy instruments that are capable of measuring maximum dose rates of only one roentgen or less per hour." Having a sensitive meter is one thing, but if it maxed out that low it won't tell you if you are walking into, or staying in, a 2 R/hr, 20 R/hr, 200 R/hr or 2,000 R/hr field!! And, this is one of those things you don't want to find out the hard way! KI4U.com has the new RADsticker™ Dosimeters, NukAlert™ - the key-chain 24/7 detector & alarm, FEMA Civil Defense calibrated meters & dosimeters, Potassium Iodide pills, fallout shelters, MRE's, etc. here! In fact, KI4U is the only private radiological laboratory in the nation specializing in calibrating & re-certifying all of our country's Civil Defense radiation meters and dosimeters, AND with over 100,000 instruments and over 6 million doses of Potassium Iodide (KI) have ready the largest emergency stockpile of both in the nation! A: The biggest nuclear fallout radiation threat, affecting the greatest number of people furthest downwind, will be from radioactive iodine, as amply documented in When An ill Wind Blows From Afar! Potassium Iodide tablets are an easy and cheap preventive for it, as also detailed there. We'll only duplicate here below how radioactive iodine, and other radioactive isotopes, like Strontium, can also affect livestock, farmland and all our food sources. The following for farmers and ranchers, is from the old USDA county defense boards. Old fashioned from the early 1960's, but physics and tactics of radiation and nuclear fallout protection are timeless. This guidance assumed nuclear explosion(s) and heavy nuclear fallout originating right here in the USA. (Fallout originating from far overseas would be less dangerous by the time it arrived here.) The following should be informative regarding the threat to, and vulnerability of, different livestock and crops that we all rely upon in the food chain. References to radioactive iodine (radioiodine) below have been highlighted in blue. How will fallout affect unprotected livestock, that is, animals in fields, postures, and other open areas? Fallout may be dangerous to cattle, sheep, horses, pigs, and other livestock as well as to human beings. Radioactive materials in fresh fallout can contaminate the immediate environment and give off rays that can penetrate deep into the body. This is the major source of danger for livestock. Animals can also suffer skin burns if fallout settles in the coat. Skin burns could produce considerable discomfort, but would not endanger the lives of the animals. Animals are about as sensitive to radiation damage as human beings; to survive, animals need the same protection as human beings. When livestock must graze on fallout-contaminated pasture, supplemental feeding from non-contaminated forage can materially reduce the daily dose of radioactive material the animals will eat. Stored or stacked hay, ensilage from either silo or trench, and stored grain are safe supplemental feeds when they are protected from fallout contamination. When no shelter is available and when the level of radiation is only moderate, or food resources are scant, growers should, if possible, supply supplemental feeding and limit the grazing time. When meat and dairy animals eat contaminated feed, some radioactive elements are absorbed into their bodies. Thus, man's food supply of animal products can become contaminated with radioactivity. How will fallout affect sheltered livestock? 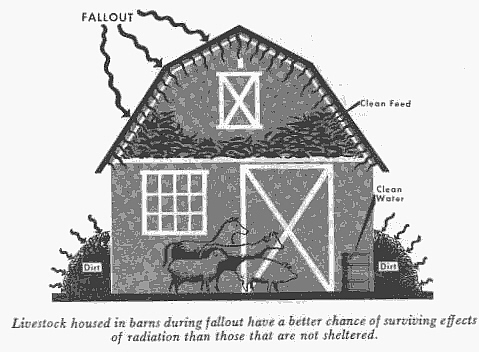 Livestock housed in barns and other farm buildings during fallout have a better chance of surviving effects of radiation than those that are not sheltered. A reasonably well-built shelter reduces intensity of external radiation and prevents fallout from settling on the animals' bodies. It also prevents animals from eating contaminated feed. What Is the best way to protect livestock from fallout? Move them indoors as soon as possible. If you do not have adequate facilities to house all animals, put some of them near farm buildings or in a small dry lot. Under these conditions the amount of space per animal in a barn should be reduced to the point of overcrowding. The limiting factor is ventilation and not space. The advantage is that the animals tend to shield each other enough that more will survive under crowded conditions than under normal housing. Large, protected self-feeders and automatic live- stock waterers can supply uncontaminated feed and water. Areas within movable fences, and other small fenced areas that have covered feeders or self-feeders, can provide emergency confinement for farm animals after early external radiation intensity has decreased through decay. Empty trench silos can be converted to livestock shelters by constructing a roof over the trench and covering it with earth. Once fallout occurs, you should not attempt to protect livestock unless local civil defense authorities tell you that you will be safe when doing so. Get your dairy cattle under cover first. What water can I give livestock after fallout? Water from a covered well, tank, or cistern, or from a freely running spring, is best. River water or pond water is less safe, but if necessary, it could be used after fallout has occurred. In a few days it would be safe. If, however, it should rain during this time, livestock should not be permitted access to pond water for an additional few days. Usually, fallout particles would settle promptly and soluble radioactive materials would diffuse in the water, reducing the contamination at the surface. If the water was constantly replenished from an uncontaminated source, radioactivity would be diluted rapidly. To prevent contamination from fallout, do not add water to covered tanks unless the water is from a protected well or spring; first use the water originally present in the tanks. Could I use water in an exposed pond? Water in an exposed pond would be contaminated, but usually the level of contamination would decrease rapidly. Such water could be used for surface irrigation. It could also he used to wash off farm buildings and unsheltered livestock. Obtain drinking water for livestock from another source if possible. What feed can I give livestock after fallout? To protect feed adequately, cover it. Fallout is like dust or dirt; a cover will prevent it from coming in contact or mixing with the feed. Grain stored in a permanent bin, hay in a barn, and ensilage in a covered silo are adequately protected. They can be used as soon as it is safe to get to them following fallout. A haystack in an open field can be protected with a tarpaulin or similar covering. If possible, give your livestock feed that does not contain fallout material. Fallout particles that settle on hay, silage, or a stack of feedbags will contaminate only the outer parts. You can remove the outer layers or bags, and use the inside feed that is unaffected. You will be notified if local civil defense and agricultural authorities who measure concentrations of fallout consider the forage growing in your area is harmful. However, this advice might come too late in heavily contaminated areas. As a precautionary measure, house the livestock and do not let them graze. You may have to give cows contaminated feed if no other feed is available. The milk from these cows should not be used by children, but when the cows are back on clean feed, the amount of radioactive material in their milk will progressively diminish. What can I do with contaminated feed? How long feed should be stored depends on the type and concentration of the radioactive materials. If you have an alternate supply, do not use contaminated feed until told by authorities that it is safe to do so; then be sure to follow the precautions they may recommend. Should dairy cows receive special treatment? Yes. Because radioactive materials can be transferred to milk, which will be a critical product during an emergency, make a special effort to protect cows from fallout. Remove milking cows from pasture and feed them stored rations during the period of fresh fallout and for several weeks after. In this way, you will prevent iodine 131 from occurring in the milk, or reduce it to insignificant levels. Give cows preferred shelter and clean feed and water. If you can, milk them before fallout occurs; you may not be able to do so for several days afterward. If you have calves on the farm turn them in with the cows. This will help prevent mastitis and conserve all the feed for the cows. Reduce amounts of water and concentrated feed to maintenance levels. Construction plans are available through State extension agricultural engineers for a combination dairy barn and family fallout shelter. Although construction of this type is costly, such a facility might be considered for the protection of highly valued breeding stock. The plans are designed in accordance with milk production ordinances. They provide for (1) a year-round production Unit that requires minimum change for emergency use, (2) a built-in family fallout protection area that allows the operator to care for animals during a fallout emergency, (3) all stored feed that is manually accessible to be inside the barn, (4) stored hay and straw for use as shielding, (5) temporary housing, feed, and water for other livestock, (6) an auxiliary generator for assuring electric power, and (7) a water supply inside the barn. What measures should be taken to protect poultry? Measures for protecting poultry are the same as those recommended for other farm animals. Poultry are somewhat more resistant to radiation than other farm animals. Since most poultry are raised under shelter and given feed that has been protected or stored, and since poultry can be grown rapidly, they are one of the more dependable sources of fresh foods of animal origin that may be available following a nuclear attack. Hens that eat contaminated feed will produce eggs that contain some radioactive elements. Radioactivity in eggs decreases shortly after the hens are removed from the contaminated environment and given uncontaminated feed and water. What animal food products are safe to market after fallout? You will receive specific instructions from local civil defense authorities based on the amount of fallout received. Do not destroy any animal food products unless spoilage has made them inedible. Milk should be safe to use if it is from cows that are adequately sheltered and protected and are fed rations of stored and protected feed and water. Milk from a fallout area where cows are not adequately protected or fed stored feed should not be given to children until civil defense authorities approve. Milk contaminated with iodine 131 can be processed into butter, cheese, and powdered or canned milk, and stored for a period of time to allow the radioactivity to decay. Food animals whose bodies have been exposed to external radiation can be used for food if they are slaughtered before the onset of signs of radiation sickness. Also, they can be used after they have recovered from the ensuing illness. The same rules that govern the slaughter of animals sick from any cause should be followed. Care must be taken to prevent edible parts of the carcass from being contaminated by radioactive materials contained on the hide and in the digestive system. What do I do if animals die from fallout radiation? Some of your animals may be affected so severely by radiation from fresh fallout that they will die in a few days or weeks after being exposed. Do not slaughter any of your livestock unless you are told to do so by local civil defense authorities or USDA county defense boards. Bury animals that die. These carcasses usually are not dangerous to surviving people or animals by the time it is safe to work outside. Is it possible to decontaminate livestock and farm buildings that have been exposed to fallout? If there is fallout on the animals skins, the radioactive material can be washed off with water. It is not necessary to use clean water sources for this purpose. Take care to avoid contamination runoff. Civil defense authorities or USDA county defense boards may advise you on decontamination procedures for your farm buildings. In handling animals, wear coveralls, gloves, and boots to prevent contaminating yourself. Cleaning or disinfecting buildings will not destroy radioactivity. However, cleaning can be useful in moving radioactive materials to a place where radiation will be less harmful. In cleaning, be careful to avoid contaminating yourself. What are the main consequences of heavy concentration of fallout on crop and pasture lands? - Farm workers may not be able to manage and cultivate land safely for some time, because of radiation hazard. - It may not be advisable to permit animals to graze, because of the danger of radiation. - Fresh fallout would provide surface contamination on all plants, resulting in potential hazard to human beings and animals consuming them. - Radiation from fallout deposited on the leaves or the ground may damage the crop. How long would fallout affect cultivated and non-cultivated lands? It would depend on the abundance and type of radioactive materials in a given area. In the event of nuclear attack, radioactive iodine would be the most critical single factor in the contamination of milk during the first few weeks. After the first 60 days, the principal hazard would arise from strontium 89 and strontium 90. Strontium 89, however, will have virtually disappeared 17 months after its formation. Like other radioactive isotopes of fallout, strontium 90 falls on the surface of plants and can be consumed with foods and forage. Some of it is deposited directly on the soil or washed into it, remaining indefinitely, for all practical purposes, in the top several inches of uncultivated land. Because it is chemically similar to calcium, radioactive strontium would be absorbed by all plants. Plants growing in soils deficient in calcium would absorb more radioactive strontium than those growing in soils abundant in calcium, other conditions being equal. Are there soil treatments for reducing the fallout hazard on land? Yes, but soil treatments should be given only after responsible authorities have carefully evaluated the situation and declared a state of emergency. The most effective treatment could be costly, and suitable only for intensively used land. Other methods involve changes in generally accepted farm practices. Some measures could be simply an improvement over local conditions and procedures. For example, liming of acid soils could reduce the uptake of radioactive strontium in crops grown on those soils. USDA soil scientists in the USDA county defense boards will provide guidance to farmers in determining best utilization of their land following nuclear attack. Any use of the land must wait until external radiation levels are low enough for persons to work safely outdoors. Would fallout permanently affect pasture grass and forage crops? If fallout is extremely light, the pasture would be usable immediately. It is difficult to set an exact external dose rate at which it would be safe to return the animals to pasture, but if the dose for the first week of stay did not exceed 25 roentgens all animals would survive and could be handled with safety. If fallout is heavy, external radiation would prohibit use of the pasture. A heavy deposit of fallout would spread short-lived and long-lived radioactive particles on the pasture and forage crops. Radiation might cause visible injury to plants. Some plants might die. Existing growths of alfalfa and other forage crops might not be usable because of radiation hazard. If a radiation survey should indicate that contamination level is high, existing growth should be removed as close to the ground as possible and discarded; succeeding growths should be used only after examination for radioactivity. If the soil is acid, a top-dressing of lime would help reduce uptake of radioactive strontium in succeeding growths. Livestock could be allowed to graze on lightly contaminated pasture after a waiting period that varies from one to a few weeks, the length of time depending on the degree of contamination. Once it is safe to work the land, a periodic check on pasture and produce in affected areas would provide the best safety guide to their use. Would fallout affect my system of farming? It could. Seriously contaminated land may need to lie fallow for as long as a season. After this, fallout may require a change to non-food crops or to food crops that do not absorb large amounts of radioactive materials from the soil. Alfalfa, clover, soybeans, and leafy vegetables have a greater tendency to absorb long-lived radioactive strontium than cereal grains, grasses, corn, potatoes, and fruits. Guidance on suggested crops to plant will come from USDA county defense boards. Would fallout reduce economic productivity of crop and pasture lands? Fallout might reduce such productivity in several ways: (1) Crop and soil management could be impeded because of danger from external radiation; (2) some crops might be killed by contamination; (3) other crops might become contaminated to a degree where they would be unmarketable; and (4) economic value of food grown on contaminated land might be less than that of other competitive crops. What are the effects of fallout on growing vegetables? Growing vegetables that are exposed to heavy fallout may become highly contaminated. Leaves, pods, and fruits that retain fallout material should be cleaned before being eaten. Washing is probably the most effective measure, just as it is the best way to clean garden foods that get dirty from any other cause. Radiation from heavy fallout may affect plant growth. Roots and tubers absorb little contamination from fallout before it is mixed with the soil. The normal cleaning or peeling of underground vegetables such as potatoes or carrots would be adequate for removing fallout. What are the effects of fallout on fruits? If fallout is heavy, ripe fruits may be lost because of the personal hazard involved in harvesting them. Fruits that do not have to be picked immediately can be saved. They should be washed before they are eaten. Would fallout limit use of plants for human food? It depends on the extent of radioactivity. Leafy vegetables, such as lettuce, should not be eaten unless they are thoroughly washed, or are known to be free of hazardous amounts of radioactive materials. What special precautions should be taken for workers in the fields? You should remain indoors until danger from fallout has diminished and you have learned from local officials that it is all right to work outdoors. By order of the President, the Secretary of Agriculture has put into effect defense services to protect farmer; their families, their livestock, and their agricultural productivity in event of a national emergency. The wide scope of these services enables them to function at all levels, national, State, county, and farm. In preparing for a national emergency, the farmer may obtain guidance and assistance from his USDA county defense board. More than 3,000 of these boards are operating throughout the Nation. The USDA county defense boards receive direction from USDA State defense boards. A USDA county defense board is composed of key USDA representatives in the county. The county office manager of the Agricultural Stabilization and Conservation Service usually serves as chairman. Other board members may include representatives of the Cooperative Extension Service, the Farmers Home Administration, and the Soil Conservation Service. Representatives of the Forest Service, the Agricultural Research Service, and the Consumer and Marketing Service, where available, are also members of the board. Each USDA county defense board is equipped to serve the farmer in many ways. In most counties, the board chairman is responsible for food production programs. He will see that guidance is available in emergency farming practices and in conserving farm equipment, fuel, and manpower; he also will help obtain essential services or material. The Soil Conservation Service member of the board will advise and assist in the proper use of land and water; and the Farmers Home Administration member will help the farmer in credit problems that may arise. The county extension agent will provide education on survival practices and protective measures for the farmer, his family, and his livestock. The board chairman, or one of the board members, will advise farmers regarding other programs of USDA agencies that are not represented on the board. This might include, for example, assistance in protection of livestock and crops against the spread of disease or rural fire defense. Generally, the board chairman is responsible for USDA programs relating to food processing, storage, and distribution. USDA county defense boards will work closely with and support county authorities. Farmers can look to their local county civil defense officials as well as USDA county defense boards for guidance in national emergency programs. Radiological monitoring is measurement of the levels of exposure by radiation present in nuclear fallout. Special instruments and people trained in their use are required for this work. 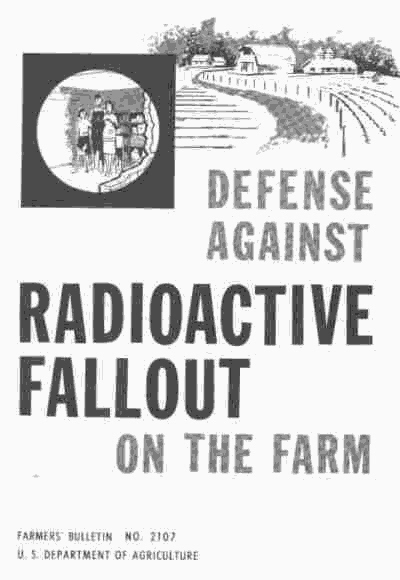 Monitoring services would be needed in the early period following a nuclear attack to determine intensity of radiation on the farm. If this intensity were high, monitoring services would be needed later to determine when farming activities should be resumed. Examples of this monitoring service are detection and measurement of radiological contamination of farmlands, harvestable crops, forest land, and water and protection and handling of farm animals. - At major meat and poultry inspection installations. - Of forest lands, agricultural lands, and water. - Of federally owned stored food. One or more USDA monitoring stations are established in each county in the United States. They provide capability to perform monitoring assigned to USDA, and they will also supply part of the radiological information needed for planning and directing local survival and recovery operations. - Care or disposition of livestock. - Use of agricultural lands and water. - Use or disposition of agricultural commodities. If you have a question about the detection of harmful radiation, you should contact your local civil defense official or the chairman of your USDA county defense board. And, this Fallout Shelters Plans & Nuclear Civil Defense FAQ you are reading now! #1 - Prompt evacuation to an area you are confident will likely not have nuclear fallout deposited onto it also, or has a much better nuclear fallout shelter awaiting you there. However, only if you know that you have time to do so. Of course, if the nuclear fallout has already begun to arrive or likely will be shortly, attempting evacuation then is too risky, especially with incomplete information as to what route would really be safer, and also not clogged then with panicked evacuees. Reality is, most need to stay and shelter-in-place, where they are, too many unknowns to risk getting stuck, and fully exposed then, on clogged roads. Or, #2 - have already prepared a nuclear fallout shelter for your family where they usually are, at or near home, from the info provided in the final 3rd section here. If the threat of nukes upwind of you was ever imminent, but had not yet happened, and you had not yet prepared; follow the instructions here immediately: What To Do If A Nuclear Disaster Is Imminent! "What Areas are Likely Targets?" "What's Required for Nuclear Sheltering?" "What Plans or Ready-Made Shelters are Available?" FEMA Nuclear Weapon Target Maps For Each State!